Vacation dreams come true in comfortable luxury in Aqua's best layout on the convenient sixth floor. Access your large private elliptical gulf front terrace from the living room, dining area or master bedroom. Gather your family or friends in the living room featuring a state of the art 50” flat screen HD TV with accompanying DVD/ CD player and libraries and I-Pod docking station. Sleep in luxurious king beds in the two elegant beachfront master bedrooms with en-suite bathrooms and double vanities, one with a separate glass-enclosed shower, or in the third luxury bedroom with queen bed and adjoining full bath. All bedrooms feature a large flat screen TV with DVD/CD player and separate CD/radio alarm clock. All stainless appliances - refrigerator with icemaker, stove, microwave, and dishwasher. Laundry closet with washer and dryer. Relax in your two private lounge chairs with umbrella in place on the beach and awaiting your arrival. All for your ultimate vacation experience. Only 1 chair was firm and high enough to be comfortable. The furnace & dishwasher required maintenance. Lighting was very poor and several of the most convenient plugs would not hold in the plugs. No reachable tables to use for drinks while using any seating but the one firm chair. The bedding in the \master bedroom was very poor. The top sheet was so large it was dragging on the floor on both sides of the bed. All the stools at the bar were very rickety requiring tools to tighten them. No tools available. The sound on the TV was very hard to hear and understand conversations. The kitchen supplies were ]]marginal at best. Phone was provided but no one knew the phone number. Calling out was okay, you could not have anyone call in. The deck furniture nice. The weather didn’t cooperate with sitting outside. I think an upgrade and maintenance overhaul would be in order. Great family get a way! We really enjoyed our family beach vacation stay at Aquq this year! 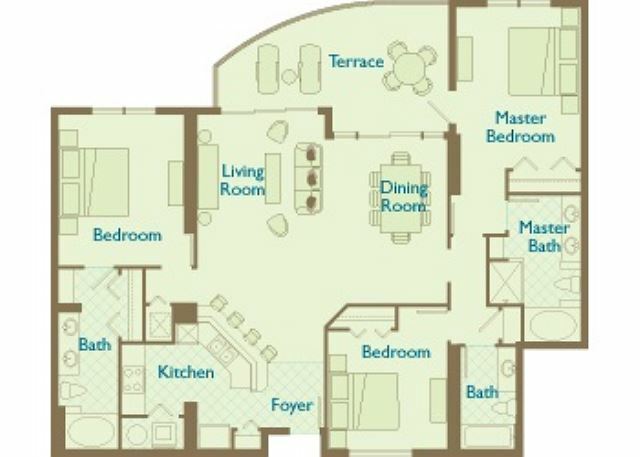 602 was a very nice condo with lots of room for our family. We had our son and daughter with their spouces, along with the two grandchildren. This condo has a set of beach chairs with it and was an added bonus. The staff at Aqua were very nice and attentive to our needs! Our group traveled from all over the southeast. We came from Louisville, KY and picked AQUA as it was right on the beach and in the middle of many activity and restaurant options. Overall we had a great stay and really enjoyed out time in Panama City. We would come back to Aqua the next time we visit Panama City. Our stay was FABULOUS!!! We loved the condo and plan to book it for next year. Room was exactly what we needed for our family.